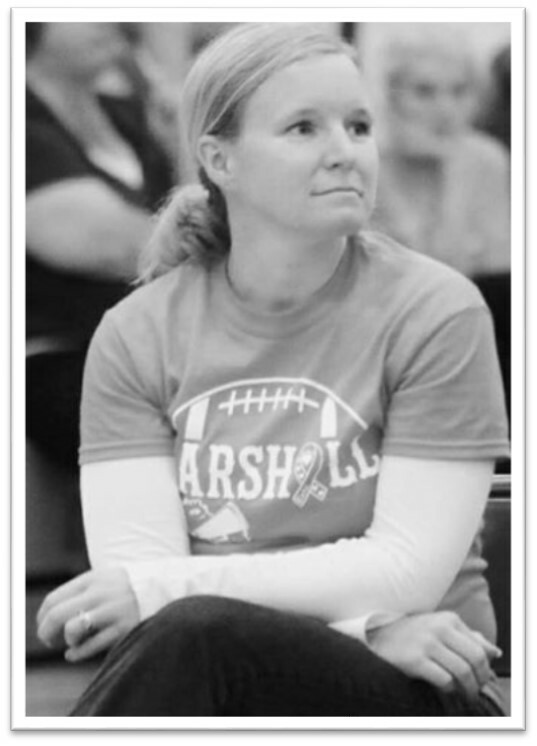 Then the sad news hit home Wednesday – Kari Searles Jolink passed away. Kari’s story was well publicized throughout Marshall and it was very easy to see how well loved she is (see game dedication). Kari was Bryce’s teacher in middle school. I meet her face-to-face during parent-teacher conferences and open school events. And even though I really only knew her as Bryce’s teacher I felt so much more a connection after hearing about her stage IV cancer diagnosis about a year ago. 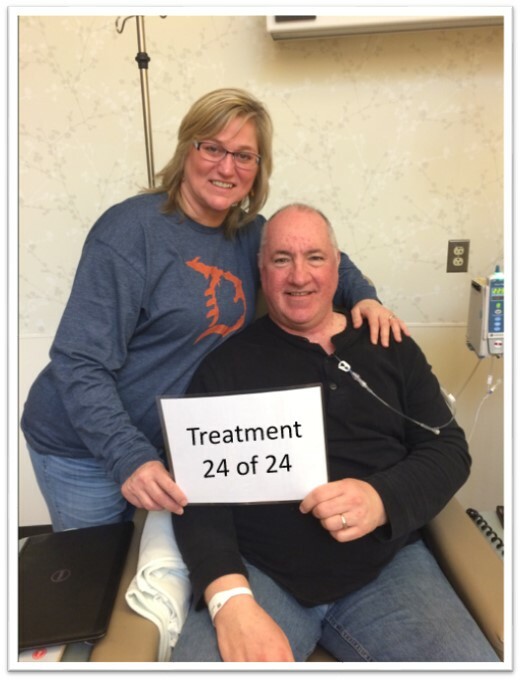 Kari was a fellow-patient at University of Michigan Healthcare Systems (UMHS) and reading her blog (link to Kari’s blog) gave me a window into an all-too-familiar battle with cancer. Kari was certainly in my prayers and thoughts from the first time I heard about her diagnosis. Along with so many others praying for her; I was so hoping to follow her story until it ended with her beating this ugly disease. Thirty-three is simply too young to die. And she was a mother of two beautiful children and had so much to offer this world. It seems natural to ask the “why” questions in the wake of so much sad news. There is a lot of suffering and dying in this world. There is very real evil in this world as well. And it is hard to imagine a world absent of disease and hatred. Our limited human perspective makes it nearly impossible to understand how these ugly realities might fit together into a beautiful master plan. While we may not know how all the pieces fit together the bible does tell us that there is a perfect master plan. It also tells that we will face trials and tribulations before we see paradise. And it tells of death coming like a thief in the night. None of us know exactly when our time on this great earth will be completed. The simple truth is that we could be gone tomorrow, or next week, or next year. Or we may be lucky enough to live a hundred years. Kari’s last words echoed loudly in my mind this entire week. “I have no regrets.” What beautiful words from a beautiful soul. And what a wonderful motto to live by. I pray that I will be able to say these same words when I find myself facing the end of time on this earth. I think the key to saying those words is to Love as fully as you can; which in turn will lead to you being loved as well. So my prayer is to learn to love a little better with each passing day. That at the end of today I will “love” a little better than I did when I stepped out of bed. And maybe I will be as beloved as Kari was to so many people. Thank you Kari for sharing your journey and your story. You have truly touched many more people than will be counted. And the way you fought the fight was so inspirational. May you be at peace and may your family be showered with Love from heaven above; through the many souls that you have touched along your journey. The day before the last Erbitux treatment. What? It was snowing like crazy outside. Announcements of school closings were being sent out by 5 PM. Unheard of… Am I going to have to reschedule chemo? So that is exactly what we did. Connie and I woke up around 4am. We left the house a little after 5am. I won’t blog about the fun we had dragging the garbage to the curb, through the foot high snow drifts (ask Connie about it sometime but remember to have a little sympathy for me as she tells of my failures). After successfully “taking out the trash” we stopped at the gas station. No way did we want to chance being stranded on the freeway with a half filled fuel tank. 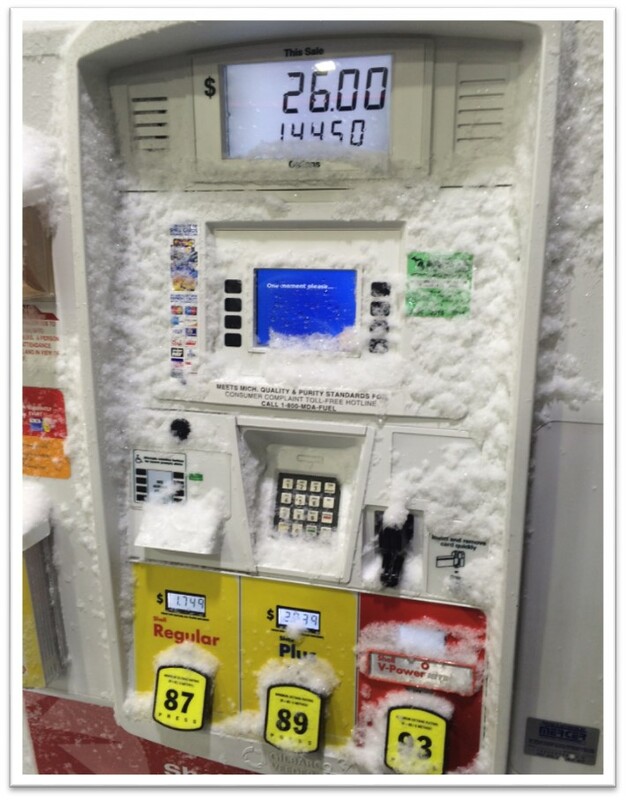 And I have to admit; I never saw gas pumps covered in snow like they were. I really wondered if I should turn around while pumping the gas. The ride to Ann Arbor was certainly slow and somewhat stressful; but we arrived safely and on time. The technician accessed my port as usual. Then another obstacle encountered. The port decided that it was not going to work. When I told the technician that this was my last chemo treatment she assured me “this glitch will not stop my treatment.” She proceeded to find a vein and drew blood the old fashioned way. And then sent us onto the infusion area. After getting checked in and led to the infusion chair the nurse tried to draw blood from the port. It was simply not happening. So she ordered the “drain-o” stuff to dissolve the blood clotting and started an IV the old fashioned way (in my arm). Nothing was going to stop this final 24th Erbitux treatment. A half hour after administering the “drain-o stuff” the nurse managed to get the port working. Soon the Erbitux was connected and flowing. And a few hours later we were done! The final treatment was concluded. In spite of the snow. In spite of the fickle port. Yes, the final treatment was done! The ride home was sunny and clear; a stark contrast to the ride there. And the CEA test came back as <1.0 once again. Thank you all for your continued prayers. As we now enter the surveillance phase of this cancer battle we ask you to pray for a continued remission. Surely this is the real test; can we stay in remission? That is our hope. And yes, there is some anxiety as we face this next phase of the battle. But there is also a quiet resolve that whatever lies ahead will be faced knowing the Lord is with us. the love which God has for us. and God lives in union with them. So here I am today. 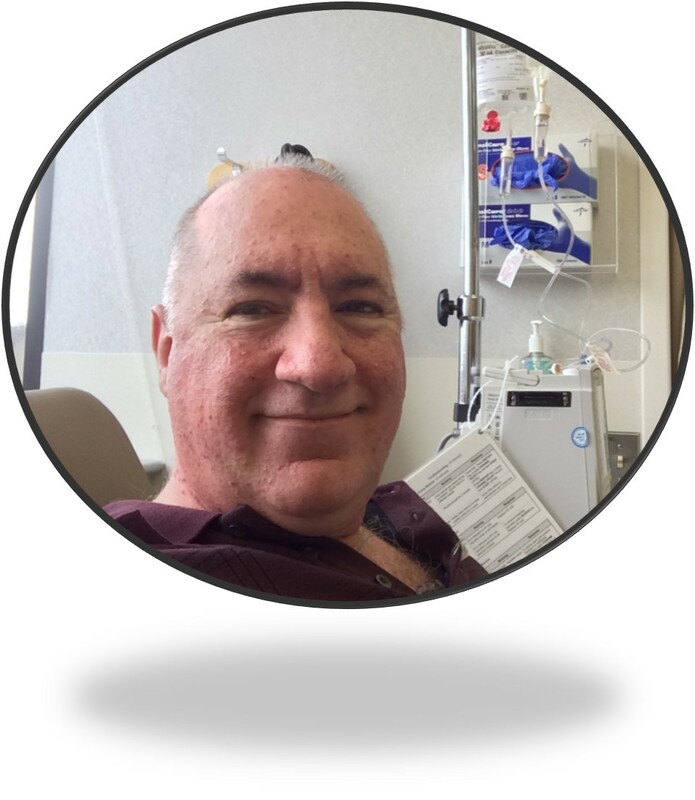 Getting the second from last infusion of ERBITUX® (cetuximab). My last treatment will be on February 25, 2016. And today my CEA is once again “< 1.0” (under one). Which, as the veteran readers know, IS VERY GOOD! Under one means no sign of cancer! On Friday March 18, I will receive CT and MRI scans and on the following Thursday, March 24, I will receive another CEA test and meet with Dr. Krauss to review results. As long as results are clear I will then begin monthly CEA blood tests and scans every three months (aka monitoring / surveillance). If I can make it five years through monitoring / surveillance I then would be labeled “cancer-free.” And believe me that is a label I will celebrate! No matter what the future holds I am very grateful for today and for this past year! No evidence of cancer for over a year is a very good thing. No surgeries for an entire year is awesome. I consider myself extremely blessed. This has been a huge blessing. And there is not a single ounce of doubt in my mind – this blessing is a direct result of all your prayers. The power of prayer is very real. And I am so fortunate to have an awesome army of prayer warriors raising up my case to our Lord. Our prayers have been granted thus far. And I am so grateful. Thank you Jesus. And thank you prayer warriors. I’m so looking forward to NO MORE CHEMO and NO MORE RASH. Wow, I won’t know how to act! The doctor surprised us today with some other news. He reported that the latest research is coming in and supporting a long-time theory that Vitamin D can help prevent colon cancer. And he has asked me to start taking vitamin D immediately. The following are a couple of the many articles and resources available on this topic. No doubt that I will start a Vitamin D supplement tonight and I will be consciously planning to weave more vitamin D foods into my diet in the coming weeks. So tonight I ask that you all echo my thanks for this past year of cancer free living. And ask the Lord for his continued grace as we transition off of ERBITUX and into the monitoring / surveillance process. PS. Tim, you mentioned that you wanted to see a chart. Well, check out my CEA History page on my blog. And don’t forget to click on the image. This will take you to a Tableau public version of the chart. While it may not seem like “all that much” it is a single graphic that summarizes my entire cancer battle. Shows CEA level changing over time, various periods of chemotherapy treatments, surgeries, and other notes (if you select other notes in the annotation menu). I shared this with my doctor and hope they may add something like this to the UMHS health portal. He did mention that his is looking for a single chart that summarizes treatments. PSS. Everyone, if you have time please watch this wonderful you tube video (link). I think it is so well done and the message really needs to be heard by everyone!